Let's pretend that I had read the instructions properly for the February 'We should Cocoa', if I had, then I would have made this recipe with quorn mince or some other suitable vegetarian alternative. However, sadly that is simply not the case, so if I am disqualified for using beef mince, so be it! 1. Brown the mince in a large pan. Add the crushed garlic and chillis and cook, stirring for a few minutes. 2. Add the tinned tomatoes, stock cube/powder and tomato puree. Cook on a low heat for about 30 minutes. 3. Add salt to taste, then add the kidney beans and the four squares of chocolate and let them melt into the mixture. 4. Just before serving add some fresh chopped coriander and stir through. Serve with rice, I used brown basmati rice, topping the chilli with sour cream or yogurt, some chopped spring onions and chopped coriander. 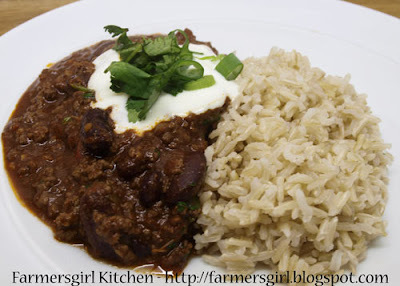 I enjoyed this chilli, the chocolate adds a depth of flavour, ours was pretty hot as I left the seeds in the chillis, I always find fresh chillis quite difficult to judge and either end up with not enough or too much heat! This looks delicious! I love chili con carne and the addition of chocolate is delicious! I went to an event last year during chocolate week at Whole Foods where I got to sample all sorts of food cooked with chocolate. It goes really well with beef and chicken. It sounds delicious. I tried to think of something vegtarian and savoury to make for this challenge but have failed utterly. I'm sure it would also work with quorn mince. OMG this looks simply divine! I too have really been struggling although I do now think I've got an idea. I love the chili chocolate aspect. It's fabulous and they top pic is brilliant! Baking Addict - would be interested to see those, did you blog them? Corina - yes it was a bit of a struggle, obviously so much so that I didn't really meet it! Dom - thanks, I was really pleased with that pic. Suzie - good to see you over on this side of my blog! Made it in the morning, out all day, home in time to make rice and heat it up, perfect. Looks very tasty ... I am making my dish for dinner tomorrow night, keep your fingers crossed for me! Looks delicious Janice. Top pic is fab and the second pic shows the depth of colour of your chilli and makes it look so tempting. 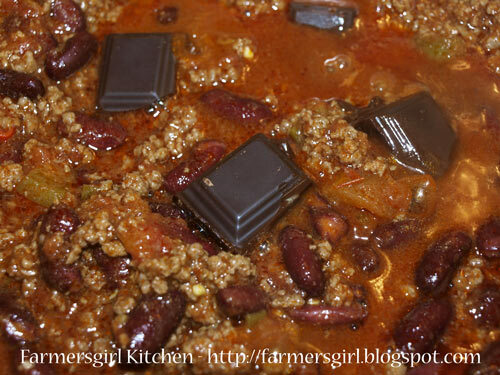 I have added chocolate to my chilli in the past but it is not a standard addition to my regular recipe. Chilli with chocolate is just perfect for a cold night. Ohhh, chocolate for a main course?! Love it! That chilli , err, quorn mince looks fantastic Janice. 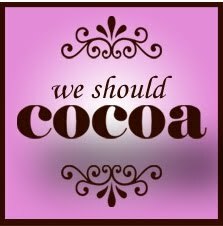 I obviously have only skim read the post, but thank you very much for participating in We Should Cocoa. What a lovely recipe and so interesting to use QUORN mince! Yay, I'm so pleased the judges will allow! Oh no, you're another clever clogs who has thought up something for WSC while I am devoid of any inspiration. Love the cheat factor - aren't vegetarians always being asked if they eat mince or chicken, as if those things don't count as meat?